-Blocks #9, #10 & #11 for the Summer Sampler Quilt. I'm almost finished with my Summer Sampler quilt top. I made three blocks this week and I only have 1 more left before finishing all 12 of them. This one was the funnest to make. It may not be perfect but it's mine and I love it. Last month my quilt guild had a Christmas in July theme and members brought in patterns or ideas for quick little handmade gifts to make for Christmas presents. 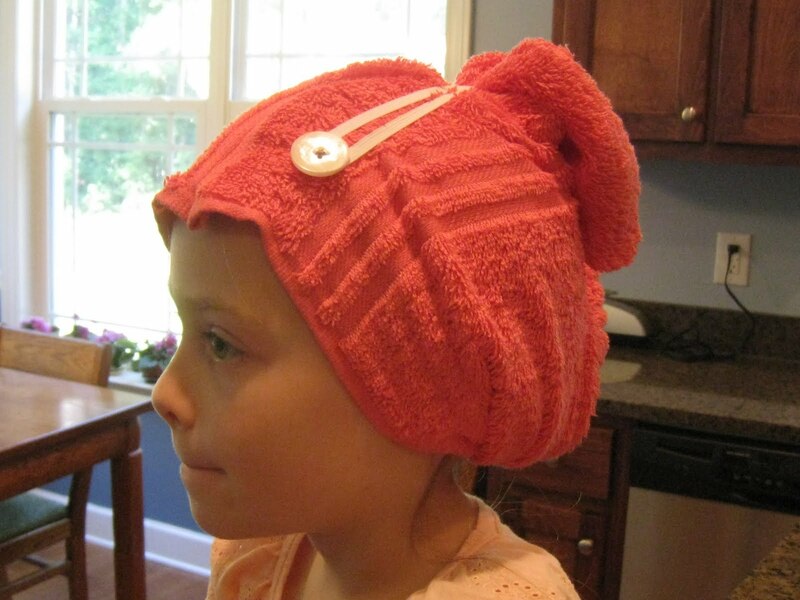 Pam brought this idea for towel hair wraps made from hand towels. 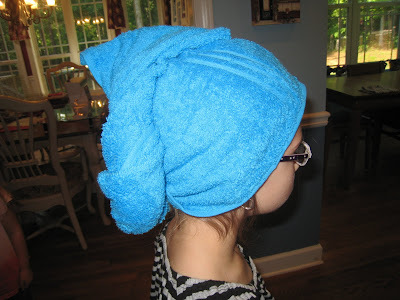 My girls are always trying to wrap our big towels around their wet hair like I do but the towel is too heavy and won't stay on. These work great and were a breeze to make! - ConKerr Cancer pillowcases - my quilt guild has already made 80 of these cases and we're hoping to make over 100 for the children who are battling cancer across North America. - Bottled Rainbows Ticker Tape Quilt Along - I'm going to lead this quilt along for my quilt guild. Rachel was kind enough to give us permission to use her quilt along in our guild. yeah! I'm excited to have a fabric swap within the guild for each of the colors we need. - My 5 year old wants a case for her KinderMat at school. I'm kind of hoping she will just cover up with her quilt and forget about wanting the case. Who am I fooling? That child doesn't forget about anything. It will just be like making an extra long pillowcase and I think I can handle that. -Cool Compassion - Top priority - must finish this over the weekend. -Purple Quilt for The Grandmomma - sorry Grandmomma. -Single Girl - tired of seeing this one listed on here. -Loulouthi - maybe next week. Baby Hooty - hasn't gone anywhere. Swoon - auditioning fabric on a daily basis - still looking. Chopsticks - looks like this would be fun to make. And last, but not least, Project Back To School is complete. 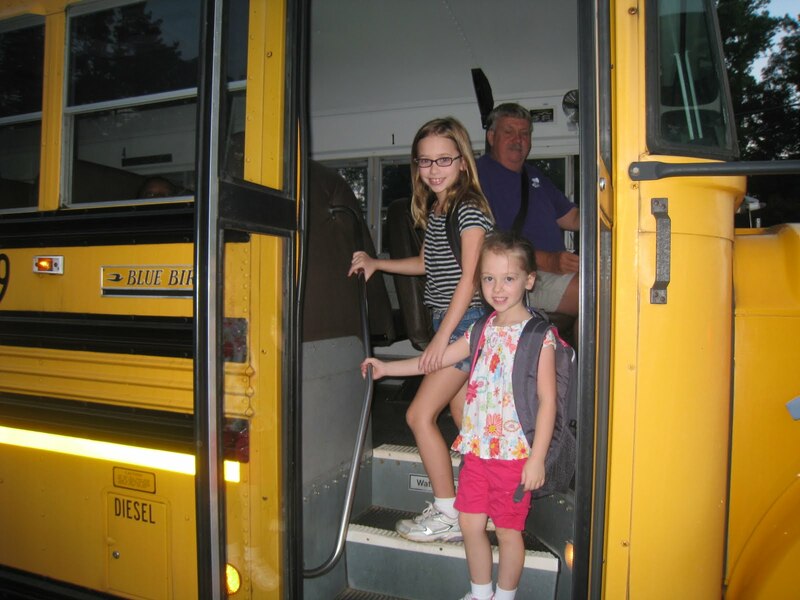 The girls went back to school on Monday and so far everything is going well. Now every afternoon I have to figure out a way to find out about their day without acting like a detective or asking questions that only get answered with a "yes" or "no". Bedtime seems to be the best time to get info out of them since the girls are all snuggled under their quilts and ready to chat a little before lights out. I just wish I could be a fly on the wall and see what they get to do all day. God bless them and their teachers! 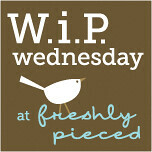 Thanks to Lee for hosting the Wip Wednesday. I love looking at what everyone else has been working on. There's a lot of amazingly talented and creative people out there in blogland. 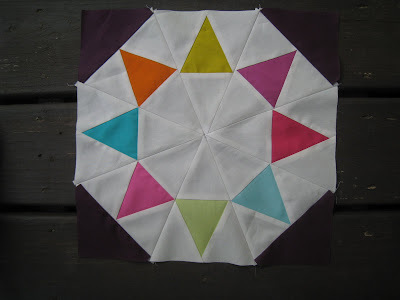 Your circle of bunting block is so cute! oh wow - back to school already!? Poor Seattle hasn't even had summer yet! Anyway, your Summer Sampler blocks are terrific - some of my favorites! Love your Summer Sampler blocks. And the little towel wraps turned out cute. I forgot I wanted to do that for Sara! 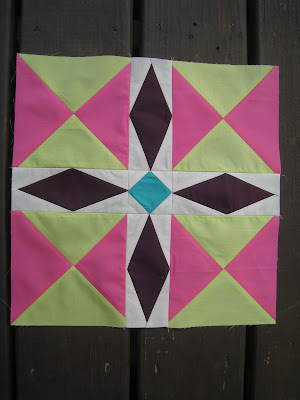 love the summer sampler blocks - your colors are wonderful! I love the summer sampler blocks! Also, those towel things are great! I am glad you made the towel wraps. They look cute on your daughters. I am excited about the Bottled Rainbow quilt. Your summer sampler blocks are great. I really admire the fact that you had all the diamond and triangle figures. I can never get seams to match up for those. The head towels are cute too. 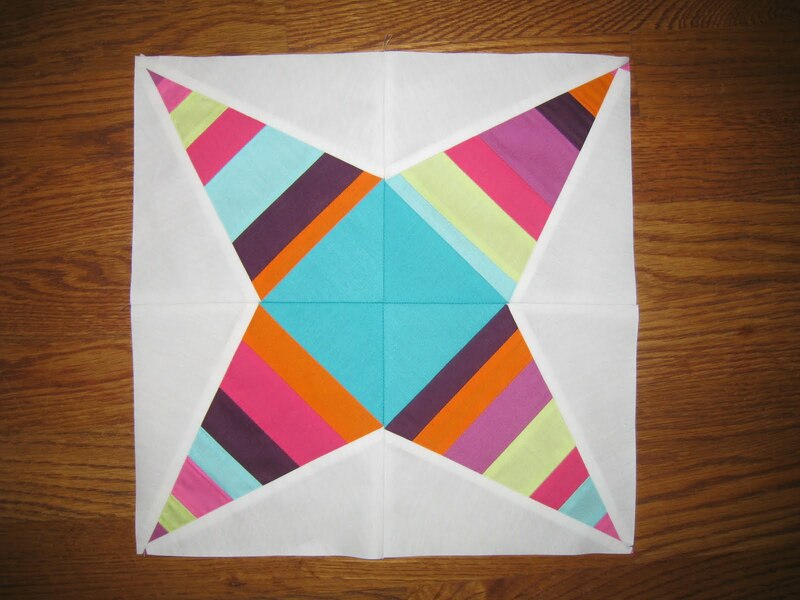 This quilt is going to be very interesting with all the solids. The girls are so sweet looking and so grown, where is the time going? I think you could do some 4 patches as sashing and it would look great bring all the blocks together. Greetings from the Amish community of Lebanon county. Have a great weekend folks. Richard from Amish Stories. I am a follower of Jesus Christ. I am blessed to be married to the most precious man in the world and we have 2 adorable little girls, ages 9 and 7. I love to touch fabric and buy fabric. I also love to cut up fabric into small pieces and sew it all back together again in one larger piece for a quilt. It's my own form of therapy. 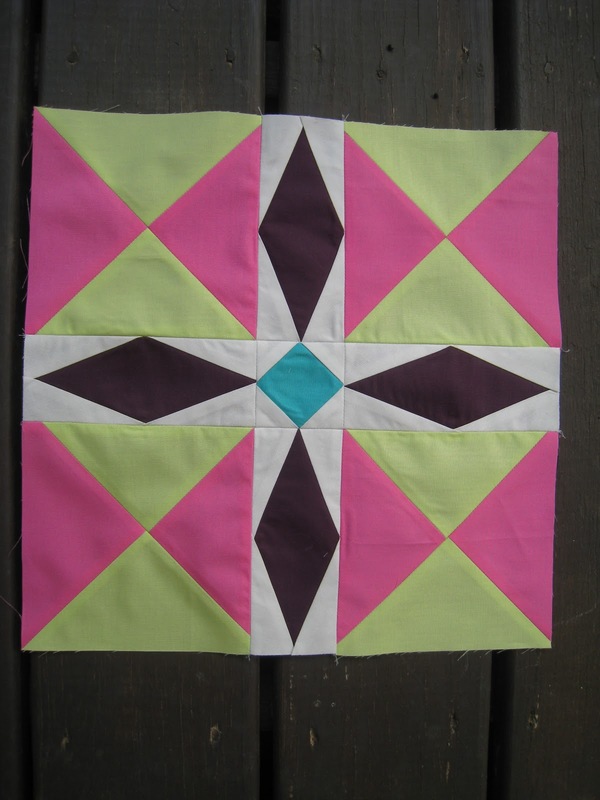 This blog tracks my adventures in quilting. If you live to be 100, I want to live to be 100 minus 1 day so I never have to live without you. Is there any way that you could know how often my heart whispers, "God keep her safe. She is my heart. I love her so." Asking a quilter to mend is like asking Picasso to paint your garage.